Marvel is making an Inhumans movie and now you're wondering who the hell they are. Wonder no more: here's your crash course. So. If you've even a passing interest in superheroes, sci-fi or blockbuster movies in general you probably saw that Marvel Studios has revealed its planned next four years of movies - collectively known as Phase 3. The roster included plenty of titles folks were expecting (Captain America: Civil War, Doctor Strange, Guardians of The Galaxy 2,) plus a few people had been seriously hoping for (Captain Marvel Black Panther.) 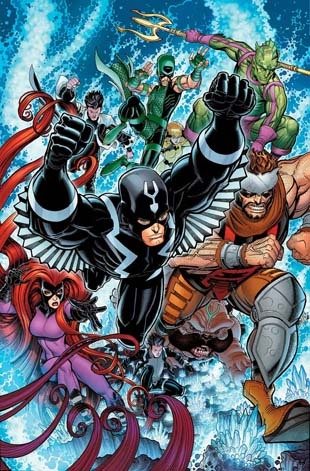 But there was also a head-scratcher: The Inhumans, slated for 2018. As Marvel characters go, they're really only "superheroes" in as much as they have special powers, exist in the Marvel Universe and know other superheroes socially. 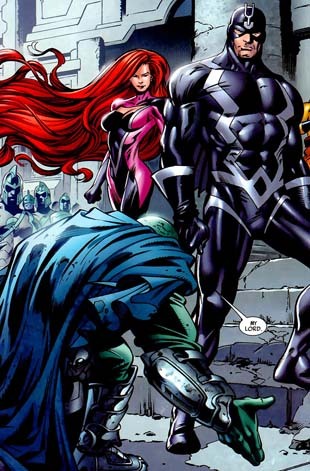 The Inhumans are both very easy to explain in the short term but very difficult to summarize in the longer term. Basically, they're a race of humanoids, most of whom have superhuman abilities (and, occasionally, monster-like physical appearances) that lead to them being ostracized by a wary "normal" humanity. How does that make them different from Mutants like the X-Men? Well... The Inhumans' backstory is ancient, more complicated and involves aliens. They live as a separate race from humanity in various secret-civilizations rather than attempting to integrate (for the most part). But beyond that? They're actually not all that different. There are good ones and bad ones, they angst over their powers and their stories generally involve interpersonal relationships and group-politics. It's just that whereas X-Men character-drama inevitably defaults to Boarding School soap-opera, Inhumans is more like Game of Thrones in rainbow spandex. Longer Version? Well, okay - you asked for it. Here's the thing: When The Inhumans were first introduced as supporting characters in The Fantastic Four, things were relatively simple. They were a lost race of alternately-evolved humanoids (their ancestors were Cro-Magnon humans experimented on by aliens) living on Earth with superpowers, who hid from the outside world and frequently jockeyed over leadership issues. Big idea stuff for what was still considered kid's fare at the time, but manageable. However, not long after that, the Marvel Universe started to go big on cosmic/outer-space storylines, and The Inhuman's ultra-malleable alien origins and presence on Earth made them a go-to place for tying the cosmic-stories to the street-level stories. This became especially common after ancient astronaut theory-devotee (and Inhumans co-creator) Jack Kirby returned to Marvel in the 1970s with his ambitious series The Eternals. Originally, The Eternals aimed to stay mostly separate from the rest of the company's continuity, but soon found itself being used for connective tissue by other cosmic-minded Marvel niches - primarily The Inhumans. Eventually, a number of those beings subjected to experiments by The Kree escaped, only to find themselves shunned by humans who had evolved on a more conventional path. Roughly 7,000 years ago, these "Inhumans" ultimately founded their own secret city, Attilan, where they could live beyond the persecution of normal humans. During this period, they learned to harness a gaseous element called The Terrigen Mist by which they were able to further alter the mutations introduced into their DNA by The Kree. However, this experimentation led to a rise in genetic deformities, leading The Inhumans to arrange their society into a selectively-bred caste system to mitigate the long-term damages.